SALT LAKE CITY – Utah’s freshman Slim Hamza has been named ITA Mountain Region’s Rookie of the Year. Hamza is currently ranked 71st in the nation and has been ranked as high as 50th during the 2011-12 season. 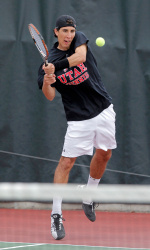 The freshman compiled a 20-3 overall singles record in his first year with the Utes while going 14-7 in doubles. Hamza joined Utah’s squad in January of 2012 from Tunisia, Africa, where he was a member of the Tunisian Davis Cup team and a Tunisian Adult National Singles Champion. He was also No. 1 in Tunisian Junior and Senior divisions and has been ranked as high as No. 69 in ITF World Rankings. Hamza earned the Utes’ best conference record during the 2012 season of 8-1 while going 3-1 against nationally-ranked opponents.